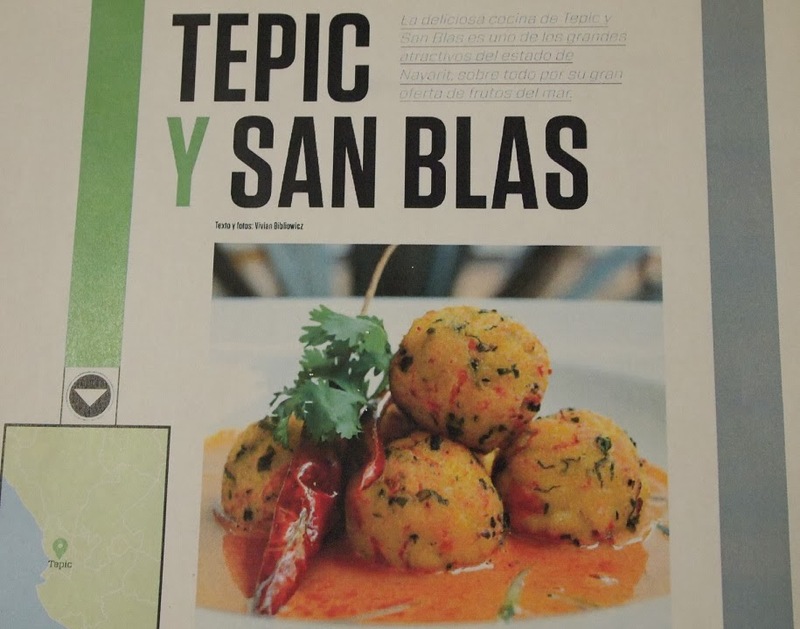 Riviera Nayarit Mexico Blog: NAYARIT'S CUISINES IS "UP IN THE AIR"
NAYARIT'S CUISINES IS "UP IN THE AIR"
Journalist Vivian Bibliowicz showcases the culinary delicacies of San Blas, Tepic and Santa María del Oro in this month’s Volaris inflight magazine. 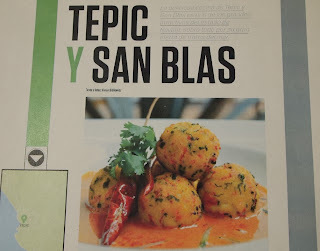 “The delicious cuisine of Tepic and San Blas is one of the greatest attractions of the state of Nayarit, especially thanks to its amazing seafood,” wrote Bibliowicz. On the page dedicated to Nayarit—titled “Flavor and History”—the writer meticulously detailed the wonderful variety of dishes that exist in the region. Among her highlights: Betty Vázquez, the official Chef Ambassador for the gastronomy of Nayarit, who Bibliowicz interviewed at her restaurant, El Delfín, located in the Garza Canela Hotel in the port of San Blas. Her favorites from the port area: the shrimp tamales, the aguachile, the oyster sopes and the banana bread, among others. Bibliowicz also wrote about the Emilianos de Tepic restaurant, which is well known for its seafood. Other smaller establishments that made the article include the seafood stand, Mariscos Fabián, and the many little regional candy shops in the capital’s downtown area. Santa María del Oro was present as well, known far and wide for its chicharrón de pescado (fried fish skin). It was here the writer fell in love with barbecued meats, including lamb, rabbit and pork cooked over hot coals. At the end of the piece she includes the phone numbers and addresses of various restaurants: Emilianos, Las Palomas, Los Olivos and El Arrecife in Tepic; plus El Delfín and Las Cumbres in San Blas. Vivian Bibliowicz is a writer, photographer and sommelier published in magazines such as Bleu & Blanc, Travesías, Escala, Clase Premier and Líderes Mexicanos, among others. Volaris is one of Mexico’s premier airlines, offering flights from Tijuana to Tepic and from Mexico City to the Gustavo Díaz Ordaz airport, just 10 minutes from the Riviera Nayarit. It also serves various cities in the United States, making it one of the top three airlines in the country.